Contemporary art has a number of interpretive frameworks, attempts to historicize the present moment that both distinguish it from what came before and draw genealogical lines from established art historical concepts. One branch of this diverse range of concepts is the return to romanticism in what some critics have referred to as New Sincerity, Post-postmodernism, or Metamodernism. A cultural counterpoint to the cool irony of much of postmodernism, this particular strand of art, music, and literature oscillates between the self-referential forms of postmodernism and the genuine emotion of romanticism. The baroque anthemic rock of Arcade Fire, the at times surprisingly touching films of Wes Anderson, and the luminous writings of Zadie Smith are all loosely tied to this broad cultural trend. Ragnar Kjartansson, arguably Iceland’s hottest artist (other than Bjork) right now, generates just this kind of synthesis between the emotional crescendos of romanticism and the deconstruction of postmodernism. The Visitors (2012), a nine channel video and sound projection, is perhaps the most accessible but also the most genuinely affecting work in his repertoire, which includes a dazzling array of intriguing work in painting, music, film, sculpture, and performance. In an age where art museum goers speed through installations at record paces, The Visitors manages to again and again captivate viewers to remain for most of its hour long cycle, as I’ve witnessed multiple times viewing the work at both the Hirshhorn Museum in Washington D.C. and at Cincinnati Art Museum. The installation’s visit to Cincinnati was organized in connection to the MusicNow-hosted Homecoming festival, a two-day event in Smale Park headlined by the Cincinnati-bred and Brooklyn-based band The National, a group whose music could also be considered part of the New Sincerity. As installed here, the nine screens all face the interior of the room, whereas in D.C. and elsewhere one screen bisected the space, a curatorial decision that changes the spatial experience to further immerse the audience. Ragnar Kjartansson, “The Visitors”, 2012, video still. Image courtesy of Cincinnati Art Museum. The setting is the mansion at Rokeby Farm in upstate New York, a site of pilgrimage for the Hudson River School of American landscape painters in the 19th century that the artist was intimately familiar with through The Blossoming Tree Performance (2007) where he assumed the role of plein-air painter for two days. 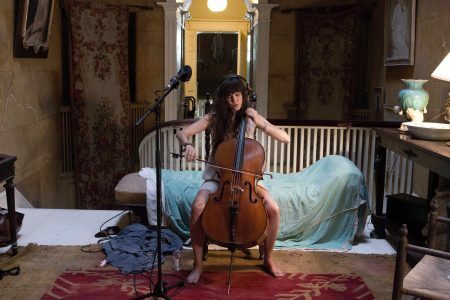 Dispersed throughout the charmingly dilapidated mansion are Kjartansson’s musician friends. Each screen is a static shot of one room of the house, save for one screen focused on a group of people on the porch. Single performers wear headphones that connect the physically separated musical ensemble. The piece begins with cameras turning on one at a time while the performers prepare, tuning instruments and speaking in English and Icelandic with directors and sound engineers off-camera. 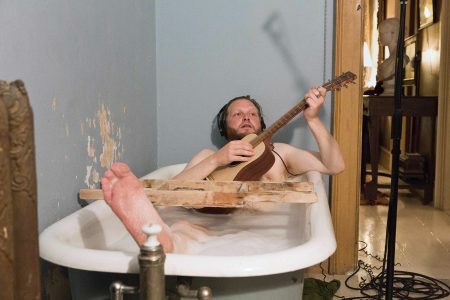 The artist, who soaks with his guitar in a bathtub performs a solo that soon becomes a chorus. As the work unfolds, the music becomes more complex, even symphonic. The lush score is both repetitive and improvised, organized largely around two refrains: “There are stars exploding around you, and there’s nothing, nothing, you can do,” and even more prominently, “once again, I fall into my feminine ways.” These refrains structure two major crescendos in the work, one punctuated by a canon blast outside the front porch. The words, based on a poem by Ásdís Sif Gunnarsdótti, are both strangely empty and genuinely moving when sung by performers dozens of times to musical accompaniment over the course of an hour. The performers’ solitude juxtaposed with the gorgeous sound of their ensemble parallels much of the experience of separation and togetherness in our contemporary technological moment. Looking at a single screen, a performer seems detached form the world, playing and singing in isolation and loneliness. Backing up from this vantage point, however, the complexity of collaboration and shared experience is genuinely moving. Eventually Kjartansson emerges from his tub and makes his way to the other rooms, transcending the group’s physical isolation as they gradually ditch their technological attachments and perform acoustically on the way to the porch. At this moment, the architectural structure of the mansion at Rokeby becomes clear as figures walk out of one frame only to emerge in another on the other side of the gallery space. While throughout most of the piece viewers moved slowly throughout the room aimlessly, almost as if sleepwalking, during this moment they move from screen to screen as if following a procession. Once outside, the friends move towards the camera and out to the countryside as the camera pans away from the house to follow them—the only camera movement in the entire piece. As their voices become faint, the group cheerfully skips off into what could easily be a sunset that inspired the famous landscape painter and originator of the Hudson River School, Thomas Cole. Crickets overtake the sound of voices and eventually we hear a crew member walking from room to room turning off cameras while humming the work’s refrain (which certainly also stays in my head for days every time I experience this work). 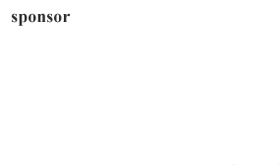 These moments where the apparatus of production are exposed are important to work’s ability to juxtapose self-referentiality and repetition with a seductively moving and emotional production. In his performance The End—Venice for 2009 Venice Biennale Kjartansson painted his friend and performance artist Pall Haukur Bjornsson in a Speedo every day for the entire six-month run of the exhibition, producing 144 paintings of varying levels of detail and quoting a host of figurative styles. While no one painting is particularly noteworthy, as a whole, the installation of 144 canvases jokingly and movingly references the unfolding of time as empty beer bottles pile up next to the sitter in a variety of pensive poses. Like The Visitors the work gathers together disparate lonely images in a single room, prompting both awareness of the process of artistic production and lyrical contemplation of time and emotion.